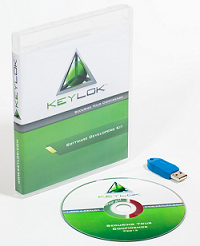 KEYLOK announces the launch of their updated Software Development Kit (SDK). An important part of the vendor evaluation process, KEYLOK provides its SDK to customers (most kits are free) so they can test the product to determine if it’s a good fit for their security and licensing needs. A SDK is a set of development tools that lets application producers create applications for a specific operating system, hardware platform or software package. In the case of KEYLOK, software producers and systems’ manufacturers use the SDK to integrate their software components with KEYLOK’s security dongle to establish and enforce application licensing compliance and protect their IP from piracy. Hands-on evaluations are the most effective and accurate method for application developers and engineers to determine if a solution fits their security and licensing demands. Typically, SDKs include application programming interfaces (APIs) in a particular programming language, debugging utilities, sample code, and supporting technical notes. KEYLOK provides all of the above, including extensive sample code in many languages, for simple and rapid integration with its customers’ applications. KEYLOK continues its support for a variety of operating systems including Windows, OSX, UNIX, and various distributions of Linux (Ubuntu, Fedora, OpenSUSE, CentOS, ARM). Move right from evaluation to production seamlessly. After prospective customers evaluate KEYLOK’s products using the SDK, customers easily move into production mode, with just a few minutes of effort. “The new SDK streamlines the process of integrating KEYLOK’s security solutions with the intellectual property of software and systems’ manufacturers. The effort to move from evaluation to production is even simpler now for our customers, making my job easier,” says Meher Malik, Product Support, KEYLOK. Request your free SDK today on KEYLOK’s website. About KEYLOK: KEYLOK is a privately-held company founded in 1980 and is a trusted provider of hardware-based security devices (dongles) for software and systems’ manufacturers across hundreds industries. For over three decades, KEYLOK has provided robust security and licensing solutions to companies who want to protect their intellectual property. KEYLOK is headquartered in Denver, CO, with customers across the U.S. and around the world. keylok.com.